When you think about the cost associated with your roof, you account for the obvious like shingles and labor but you never consider this hidden expense. We can warn our customers about it and there are some signs that may indicate how expensive things could get but a true dollar amount can not be calculated until we begin the job. I am talking about rotten plywood. The plywood underneath your shingles can become rotten over time due to expose to water, usually a result of faulty shingles or condensation. We typically see rotten plywood on older roofs but all roofs can still have it. Even more, all sheets of plywood that are rotten absolutely need to be replaced before new shingles can be installed. 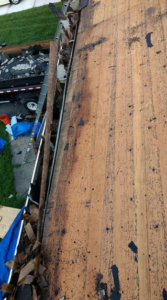 So, although you’ve planned on spending X amount on your new roof, if you have several sheets of rotten plywood, that cost could rise by hundreds of dollars. The short answer is, nothing. There is no magic way to tell there will be an added expense for rotten plywood beforehand. Sometimes, when you walk on a roof you can tell there is rot by the feeling; your roof will feel crunchy. However, we have been on roofs with no indication of rot and there ended up being several sheets. Yet, there are a few things you can do to help alleviate the financial burden of rotten plywood. Older roofs are more likely to have rotten plywood. A common practice back in the day was to install new shingles onto existing shingles. This was less expensive and less labor intensive because the roofer did not have to tear off the materials. However, sometimes this traps algae and bacteria that was on the original roof along with any leaks or problems. If you know your roof is older or has several layers, it is good practice to add a few hundred extra to your roof budget. Nothing is a worse surprise than finding out your roofer is charging you more for rotten plywood. 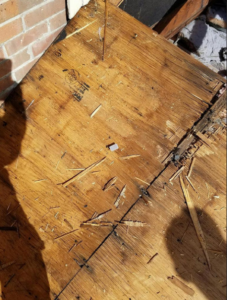 This is why at Modern, we make the procedure very clear in the event we find rotten plywood on your roof. Our contract not only states the price for per sheet for new plywood but we also discuss it with each customer beforehand. Having an open discussion eliminates the surprise element and can you give the best and worst case scenarios. 3. If there is rotten plywood, have them show you it. This is especially important if there are several sheets. I would never want to pay a few hundred dollars and just take someone’s word for it. Your contractor should be able to show you all the sheets they removed that are rotten and that they are charging you extra for. This eliminates any questions or disputes. You can see exactly why the sheets were removed and know that it was a necessity. The hard truth is, you should probably add a few hundred extra dollars to your roof budget or quote. It is better to be prepared than to be stuck owing more than you expected and devising a way to pay. If you end up owing less than your budget, now you have a few hundred extra bucks in your wallet and a brand new roof. For questions about rotten plywood or to get a roofing quote, you can contact us!